A little late posting this, but here a few pictures of my Project 3. I have already explained in the previous post a description of what I put together, and I am thinking of waiting till I post documentation for my Final Project to put up the code. Since I will be recycling a lot of it from Project 3, I would rather post the most updated and final code at the end rather than post an incomplete version now. For my final project, I plan to use the result of my Project 3 and polish it aesthetically and technically. 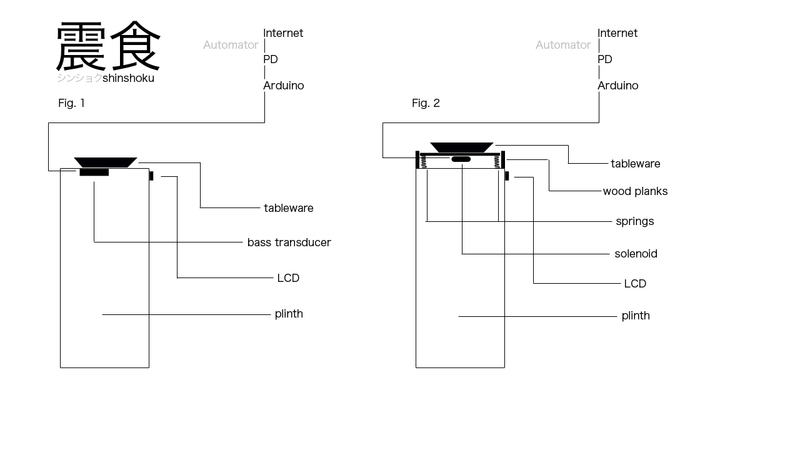 As of now I have created a system that reads real time earthquake updates from around the world and depending on the magnitude it receives, disrupts and shakes a set of Japanese tableware by use of solenoid. While artists such as Susy Bielak, in her work “Quake/Temblor”, have previously explored the relationship between humans and geographic disaster, my motivation ultimately comes from my own first hand experience of Japan’s recent large March 11th earthquake. While I got off relatively easy (knowing I had a home and family outside of Japan that I could “return” to) my Japanese friends and family did not. A week of aftershocks and lack of news coverage was more than enough to leave me wondering how much control I had over my life and to realize that even the common act of sharing a family meal without fear of disruption should not be taken for granted. That said, the choice of Japanese dinnerware will hopefully work as a metaphor for the stability of shelter and family ties (namely in Japan) being broken in some way with each new earthquake being recorded. Ultimately, it is not the tangible rattling of plates that I am hoping to capture on the plinth, but the knowledge of disruption and unease that is happening somewhere in the world outside of the viewer’s “stable” gallery. For the next iteration of the project I am going to experiment with bass transducers to cause the plates to rattle rather than a solenoid for what I think will give me better control and results. However, I may also try a couple variations of my current solenoid set up as well. I am also planning on attaching an small LCD screen that will show the magnitude and location of each quake to bring a little more immediacy to the piece. For my second project I decided to use analog inputs from a flex sensor and a light sensor in order to create a small prototype for a larger and more complex weather sound sculpture. The idea behind the prototype is that the flex sensor would be able to pick up fluctuations in the wind while the light sensor could detect if the sun was obscured or not. The inputs from the sensors are then used to control the quality and timbre of sound that the sculpture outputs. In the prototypes case, I fed Vivaldi’s “La Primavera” through a granular synthesis patch and depending on the amount of light the sensor was receiving, would re-organize and modify the song to be more ominous or light hearted. The flex sensor served as a cross fade between “La Primavera” and a wind noise (which also changed quality depending on the light sensor). Ultimately, I would like to incorporate some sort of feedback into the piece, in turn creating a more interesting and evolving sound sculpture than it is now as well as possibly messing around with the different sound sources that it draws from (such as using current news weather reports). For Project 1 I put more effort into creating an interesting system and less on its aesthetic output. That said, the code below (while embarrassingly messy at the moment) uses a few different computer vision techniques to track and record people’s position in front of the camera and in turn display who in the past has occupied the same general area as the current viewer. The code also removes the background from the footage being captured so when it is played back to future viewers, only a past figure appears and not the background (if the bg remove is clean). Finally, as a current viewer is looking at the piece, they are also being recorded and their positions saved into the system and thus in advertently contribute to a future viewer’s experience of the piece. Once again, the code is not perfect and I am still having a hard time accurately recording the face positions, but I think it is a good start. There is also probably a much more efficient way to get what I have now, but I need to learn a little more before I get to that point. Finally, asthetically it could be better, but I decided to get a working system first.